I recently watched a TED talk by a teacher of classic languages named Phuc Tran, titled “Grammar, Identity, and the Dark Side of the Subjunctive.” While the topic sounds dry, Tran made a fascinating argument about how grammar shapes our perspective of the world. Tran, who emigrated with his family from Vietnam in the 1970s, explains that the subjunctive mood, while prevalent in English expression, is not present in Vietnamese. This gives Tran access to a worldview and a means of expressing himself that is not available to his other family members who never fully assimilated into English language and culture. As Tran describes the subjunctive (and I don’t claim to be conversant enough in the technical intricacies of English or Vietnamese grammar to affirm whether his premise is entirely accurate), it is the mood that expresses a possibility, or the conditional nature of an action. The indicative mood in English is the one that describes an actual action: “I am giving a sermon right now.” The imperative is one that makes a command or request: “Sit back, relax, and pay attention.” And the subjunctive wavers in-between, used in statements that do not describe known, objective facts: “I fear this might take a while.” Tran confesses that at times he has found the subjunctive to be dangerously disheartening, as it can lead one to dwell on “what might have been.” He makes reference to a Gallup poll that was conducted in 2011 that found that residents of Vietnam were among the most content in the world, and posits that this might be because their language shields them from grappling with the subjunctive. But I think that it is the subjunctive that gives purpose and meaning to our lives. Particularly during these High Holy Days, when we are challenged to engage in introspection, we need the subjunctive to help us envision opportunities for the future. The process of teshuvah requires us to live in the subjunctive world of possibility: May we keep far from evil in the coming year, may we resist the temptation to do things that we know are wrong or hurtful. Were we to ignore this potential for change, were we to eliminate the subjunctive from our liturgy and from our personal atonement, we would lose the depth and nuance that make these High Holidays so essential to our spiritual growth, we would deny ourselves the opportunity to see the world as it might be, rather than settling for the status quo. We are commanded on this Day of Atonement to afflict ourselves; the Torah states: “V’anitem et nafshoteichem; you shall afflict your souls.” . For most, this means engaging in the fasting that has become so closely associated with this day. But the rabbis defined other forms of “affliction”: abstaining from sexual relations, avoiding washing or bathing, not wearing perfume or ointments, and shunning leather shoes and garments. By refraining from these items and activities, they theorized, we could focus more acutely on our needs and the needs of those around us. We could live for a moment in the land of the subjunctive, our eyes opened to the chances for change within ourselves, and to the possibility of helping to make the world a better place. When we permit our imaginations to take us into the realm of the subjunctive, to imagine things as they might be, we may be inspired to heed Isaiah’s call. We may come to believe that we can truly make a difference in the life of others, and improve the world in the process. In November of last year, my friend and colleague Rabbi Rebecca Einstein Schorr posted a Facebook message that was as intriguing as it was cryptic: “Looking for 36 brave rabbis.” I messaged her back, asking if she was looking for nominations or volunteers, and quickly was drawn in to the scheme she had devised: 36 rabbis would agree to shave their heads for the sake of raising funds and awareness for pediatric cancer. The project was conceived in honor of Sammy Sommer, the eight-year-old son of my dear friends and classmates Rabbis Phyllis and Michael Sommer, who was then battling leukemia. Those of us who signed up for the project—which eventually grew to more than 75 participants—were moved not only by our love for the Sommer family, but also by our belief that our minor sacrifice could have a major impact. Shaving a head, of course, does not directly lead to a cure for cancer. If it did, I’m sure that all barbers would have lines out the door. Sammy died in December, and our endeavor was transformed from being in his honor to being in his memory. After Sammy’s death, any one of us could have pulled out of the venture. To be honest, my own family wasn’t thrilled with the idea of my impending baldness. They understood and embraced the cause, but weren’t so happy with the shave itself. But, as one of my colleagues noted, hair grows back; children don’t. My belief in the world of the subjunctive was one of the things that cemented my involvement—my conviction that our efforts could create a world of possibility so that other families would not have to endure the pain and heartbreak that the Sommers had felt. On April 1, when I stood on stage with my colleagues and the shave began, a flood of emotions washed over me. I felt a mixture of love, sadness, and pride. I knew that I had just been involved in something very important, possibly world changing, because we had dared to wander into the world of the subjunctive, the world of potential. We were able to project what might happen if drug therapies were developed that were designed specifically for pediatric cancers, rather than relying on toxic cocktails developed for and tested on adults. We were able to envision that the 43 children who are diagnosed daily with pediatric cancer could have hope of growing into healthy adults, without residual side effects from their childhood treatments. We had no way of knowing whether the money we raised would be sufficient to fund the research toward finding a cure, but that did not prevent us from dreaming big. To date, our campaign has raised over $650,000 through the St. Baldrick’s fundraising community, and we continue to accept donations at least through the close of this calendar year. Money, prayer, outpourings of love—none of these could bring Sammy back, no matter how fervently we wished it were possible. But through my involvement with St. Baldrick’s and with this project, I learned the stories of other children battling cancer. Through my work with all of you, I have learned additional stories of loss, of struggle, of suffering, and of survival. And I am strengthened in my resolve that we must continue to work toward a cure for cancer, for Alzheimer’s, for Parkinson’s and for the myriad of other ailments that are so devastating to our families and our communities. I am emboldened in my belief that we can change the world for the better, and I find encouragement within the realm of the subjunctive. The Hebrew term Tikkun Olam—literally, “repair of the world,” is often used to describe such deeds of social action. As Jews, we believe that we have both the opportunity and the obligation to perfect the world, to help fulfill God’s original vision for creation. It’s not an easy task, but it’s a rewarding one. On Thursday, I met with a group of clergy, laypeople, and social service professionals as part of an interfaith alliance that we are attempting to put together in Champaign-Urbana. Our plan is to utilize the collective strength of our congregations and institutions to bring about positive changes in our communities. We hope to address issues such as poverty and homelessness, sustainability and the environment, and children and family issues in order to work for the common good. Among our first undertakings will be exploring how we can help to ensure that emergency shelter spaces are sufficient to meet the needs of the homeless during the cold winter months. 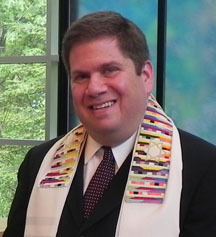 As our group evolves, I hope that many from Sinai Temple will embrace our undertakings. We believe that our various faiths have the common goal of helping the less fortunate in our midst, and we believe in our ability to make a difference. That’s the power of the subjunctive. Here at Sinai Temple, there are many opportunities to engage in Social Action. Of course we have our annual High Holiday food drive today, benefitting the Eastern Illinois Food Bank. Through your generosity, we donated over $5,000 and 500 pounds of food last year; we hope to meet or exceed that amount this year. Hunger and poverty continue to plague our community, with more than 22% of children in Champaign County living below the poverty line. Our ongoing partnership with the Atlanta Bread Company allows us to share their extra baked goods every Monday with the residents of the TIMES Center. When you leave Temple today, you may wish to take with you either “Mitzvah Bags” or “Comfort Bags,” which are found by the front door. Mitzvah Bags contain non-perishable snacks; Comfort bags contain toiletries. Our Religious School students packed these bags last spring as part of the Jewish community’s Good Deeds Day. The intent is that you keep them in your car; when you encounter an individual who is in need of assistance, you may distribute the bags instead of cash, and help to brighten his or her day. We are gearing up for our next Mitzvah Day, which will take place on Sunday morning, November 2. Our Social Action committee is hard at work lining up Tikkun Olam opportunities; watch for a link to the sign-up website in Monday’s email blast. There you will be able to register for great projects, including donating blood with Community Blood Services, or getting your cheek swabbed so that you may be added to the National Bone Marrow Donor Registry. There are options for people of all ages. Join with us to make a difference; help us to transform the world as it is into the world as it should be. There will be a number of other Social Action projects throughout the year. On Thanksgiving, your generous donations will help us provide full turkey dinners to clients of Family Services. During the winter holidays, we’ll again deliver Meals on Wheels. In January, we’ll collect funds to support local scholarships in memory of Dr. Martin Luther King, Jr.; last year Sinai Temple raised nearly $3500 for this worthy cause, which is a congregational record. Our Social Action committee is always welcoming new participants and new ideas for engagement with the community as we strive to make a difference. Making a difference is, I believe, our highest calling. If we spend our lives focused only on our own needs and desires, and don’t interact with this world, then we are not, in my opinion, living up to our fullest potential. The sage pondered the question for quite some time. He realized that the boy was trying to trap him. He knew that if he said the bird was alive, the boy would crush the creature in his hands and reveal that it was dead. If he answered that the bird was dead, the boy would open his hands and release the bird to the winds. In this New Year, we hold in our hands a world of possibility, an opportunity to truly make a difference. May we each have the courage to respond to the challenge, to enter the realm of the subjunctive, and in so doing, may we change the world for the better.